Coming one week after the publication of the European Commission Second Report on the State of the Energy Union, the FCH JU is welcoming the launch of one of its biggest energy projects, H2FUTURE, which took place in Linz, Austria. Green Hydrogen produced based on CO2-free green electricity presents enormous potential for use as an industrial process gas, as well as for energy storage. The H2FUTURE project is an important milestone on the path towards coupling the energy and industry sectors.The consortium leading this project symbolises the type of partnership needed to address the sectorial challenges in an integrated manner. 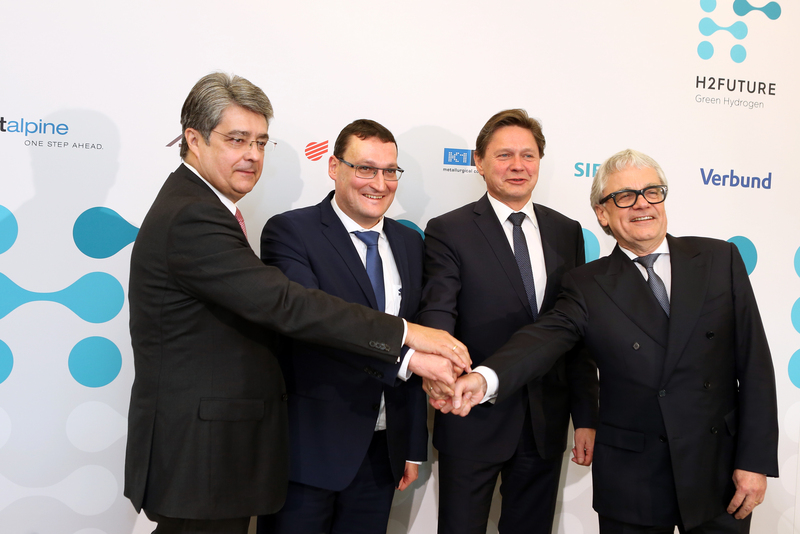 Companies like voestalpine, Siemens, VERBUND and Austrian Power Grid (APG) as well as the research-partners K1-MET and ECN, will aim at the construction of one of the world’s largest electrolysis plants for producing green hydrogen. The project-partners will work and research cooperatively on implementing an innovative hydrogen demonstration plant at the voestalpine site in Linz. The FCH JU has allocated 12 million EUR in funding from the EU Horizon 2020 programme, the EU biggest Research and Innovation programme, for implementing this project with the goal of producing green hydrogen. The green hydrogen for industrial use and for balancing the power reserve market will be produced in one of the largest and most modern electrolysers using the proton exchange membrane (PEM) technology. The total project volume amounts to about 18 million EUR over the course of 4.5 years. The key partners in the project are the companies voestalpine, Siemens and VERBUND. The plant will be built and operated on the premises of voestalpine in Linz. The green hydrogen generated there will be fed directly into the internal gas network, allowing the testing of the use of hydrogen in various process stages of steel production. The technology supplier for the proton exchange membrane electrolyser is Siemens. VERBUND, the project coordinator, will provide electricity from renewable energy sources and is responsible for development of grid-relevant services. Further partners in the project are the research institution ECN from the Netherlands, which is responsible for the scientific analysis of the demonstration operation and the transferability to other industrial sectors, and the Austrian transmission system operator APG, which will provide support in integrating the plant into the power reserve markets. The Austrian COMET Competence Center K1-MET provides its expertise in the operation of the plant and demonstrates the potential applications in the European and global steel sector. This project is a great step for greening industry in Europe and boosting sustainable growth.